As it should be, content is once again crowned King as the top way to optimize your site and your pages for search engines. 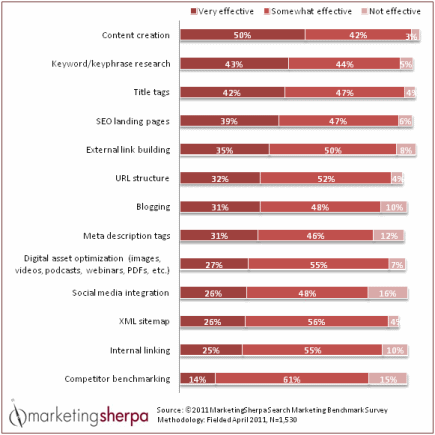 Marketing Sherpa just put out a nice graphic the shows the most effective tactics employed by over 1,500 search marketers. Are you paying enough attention to the content on your page? What about some of the other tactics listed in the article? Link to full article on Marketing Sherpa.